HOORAY FOR JORGE! YANKS WIN A.L. EAST!! What a night at Yankee Stadium! If you were looking for real drama then you need not have looked any further than tonight’s dramatic win in the Bronx. CC Sabathia pitched his heart out for 7 1/3 innings and left with the score knotted up at 2 still looking for his 20th win of the season. Enter David Robertson with the bases loaded and one out. He gets out of the jam by inducing a double play ball to end the inning. Fast forward to the bottom of the 8th inning. Bases loaded. Joe Girardi puts in the forgotten 40 year old veteran, Jorge Posada as a pinch hitter to face Jake McGee. A smart move on Girardi’s part as the only other time Posada had faced McGee, Jorge had hit a grand slam home run. The crowd stood and cheered their approval as Posada lined a single to right to drive in two runs which turned out to be the winning runs in a 4-2 day-night double header sweep of the Tampa Bay Rays. Posada who had lost the catching job earlier in the year to Russell Martin and subsequently the DH role as well, stood at 1st as the Bronx faithful gave him a standing ovation. Talk about drama…. The biggest reaction in the Yankee dugout was from his closest friend, Derek Jeter, who was also the first to hug Posada during the celebration that ensued. 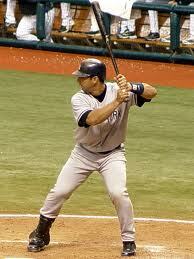 And then it was Mariano who Posada caught in so many momentous games. It was the 17th A.L. East title for the Yanks but it looked just liked their first…. especially when ‘old faithful’, #20 made it all possible. Way to go Jorge! !